“As one of the Board Members of the Carlisle Foodbank I am having to send out an urgent request for food donations as our supplies have run alarmingly low. Whilst we continue to benefit from the generosity of regular donators, the fantastic bumper amounts that are given at Christmas, Easter and Harvest Festival have long left the shelves. Meanwhile demand remains steady. (Average bags per week: 95 adults and 25 children). We have recently had to supplement the donations with bought in supplies. In fact we are currently having to spend around £150.00 per week. Without a surge in food donations, this amount will inevitably increase from the end of July onwards as a result of the impact of the roll out of Universal Credit in Carlisle (25.07.18). The Foodbank is not in a position to sustain such a financial burden, we are dependant upon donations. Food items can be left at Christ the King - there is a basket in the porch - larger items can be left behind the gates of the Last Supper Chapel: please help if you can. We have been asked, as a parish, to contribute £9000 towards the expected £75,000 build cost for a new chapel within the new Newman School. If you would like to make a donation towards the building cost, this can be made via cheque [‘Newman Chapel Fund’] or in cash. Please enclose in an envelope marked ‘Newman Chapel Fund’. Holy Mass will be offered regularly at Newman School for the intention of benefactors. Parish total so far is £7,620. To be held on Sunday July 8th from 2.00 pm - 5.00 pm. If you, or if you know of any business, that would like to donate raffle prizes, then please get in touch with the school. The day will include an exhibition of photos of 80 years of the school, a short screening of a documentary about the school, bouncy castle, stalls and much much more. Stalls are available for hire at £10.00. Once again, St Margaret Mary SVP will be distributing food parcels to local families before the school summer holidays. Tinned fruit and meats are especially welcome. We aim to distribute parcels the week beginning 9th July. Thank you once again for your continued support. Bishop Paul Swarbrick will celebrate the Sacrament of Confirmation for the parish during the 11.00 am Mass on the Feast of Christ the King [25th November]. Catechesis for young parishioners will commence on the 16th September and will be held fortnightly on Sunday evenings [6.00 pm to 7.00 pm]. Parents of youngsters aged 10 or above, who have not received the Sacrament of Confirmation, should email names to Fr Michael [sacredheartcarlisle@icloud.com]: this is to enable resources to be ordered in good time. Figures unavailable when going to press. Any boy who has made his First Holy Communion is invited to serve on the sanctuary during the celebration of Mass. Any girl who has made her First Holy Communion is invited to become a ‘Handmaid of the Sacred Heart’ and assist in the setting up of church for the celebration of Mass. The refugee and migrant crisis is bringing a faraway world close to us. What could lead people to leave their homes, communities and country to find a new life in Europe. How we can help? Carlisle One World Centre is our local charity seeking to raise awareness and understanding of other cultures and countries and mutual interdependency. Being a supporter of Carlisle One World Centre costs just £12 a year and affords the opportunity to engage with their work. Consider joining their small committee to help plan and promote their work. They’re particularly interested in people who have lived and worked in other countries and cultures. To find out more, please look at www.cowc.co.uk; email agill.cowc@gmail.com or phone Adrienne on 07881-488566. A three-day gathering for young Catholics, aged 16-23 years from 24-27 July at Hinsley Hall, Leeds. 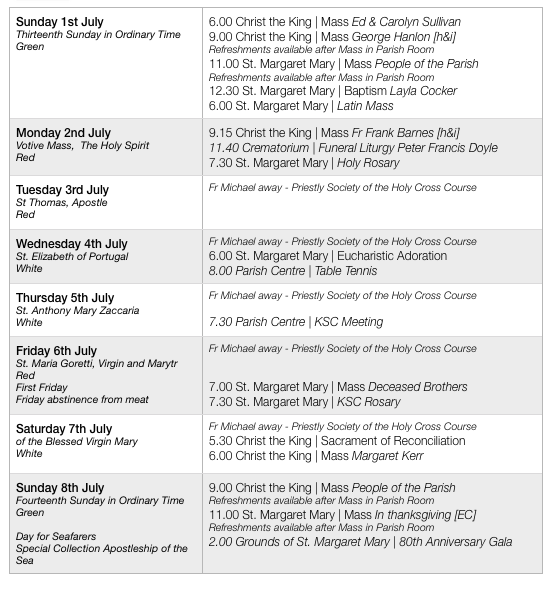 Organised and funded by the Knights of St Columba. Further details from Tony Parrini: email tony.parrini@btconnect.com or telephone 674553. 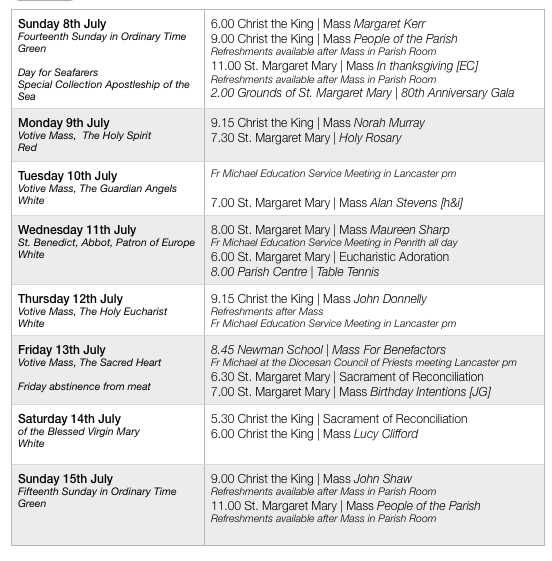 Please make a note of the times of Mass this week, particularly on Wednesday and Thursday. “As one of the Board Members of the Carlisle Foodbank, I am having to send out an urgent request for food donations as our supplies have run alarmingly low. Whilst we continue to benefit from the generosity of regular donators, the fantastic bumper amounts that are given at Christmas, Easter and Harvest Festival have long left the shelves. Meanwhile, demand remains steady. (Average bags per week: 95 adult and 25 children). The Foodbank is not in a position to sustain such a financial burden, we are dependant on donations. We have been asked, as a parish, to contribute £9000 towards the expected £75,000 build cost for a new chapel within the new Newman School. We are very grateful for a further donation of £100 this past week. If you would like to make a donation towards the building cost, this can be made via cheque [‘Newman Chapel Fund’] or in cash. Please enclose in an envelope marked ‘Newman Chapel Fund’. Holy Mass will be offered regularly at Newman School for the intention of benefactors. Parish total so far is £7,620. Bishop Paul Swarbrick will celebrate the Sacrament of Confirmation for the parish during the 11.00 am Mass on the Feast of Christ the King [25th November]. Catechesis for young parishioners will commence on the 16th September and will be held fortnightly on Sunday evenings [6.00 pm to 7.00 pm]. 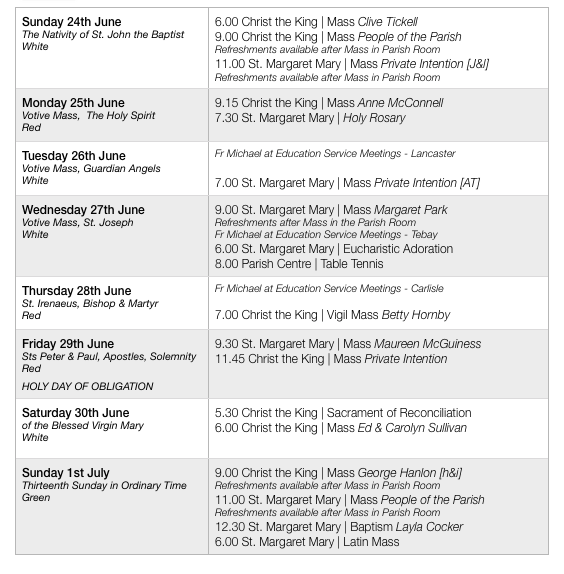 Parents of youngsters aged 10 or above who have not received the Sacrament of Confirmation, should email names to Fr Michael [sacredheartcarlisle@icloud.com]: this is to enable resources to be ordered in good time. To be held on Thursday 5 July at 7.30 pm in Carlisle Cathedral. Join The Sixteen in an exploration of the sacred and secular works of 16th century composers William Cornysh (both father and son) and 20th century master of the voice, Benjamin Britten. 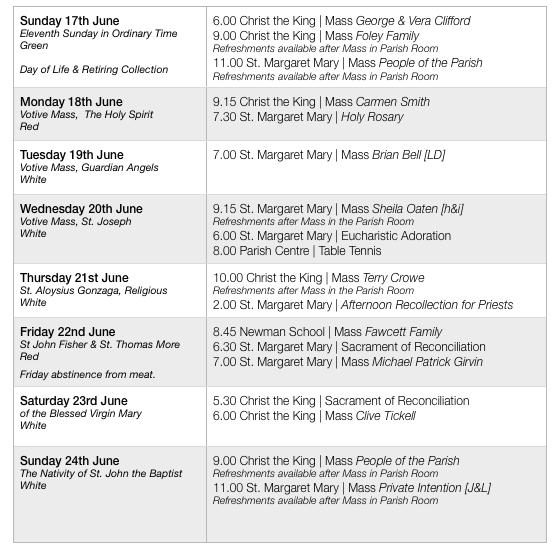 Are recording a programme on Tuesday 3 July, from 6.30 pm - 9.30 pm in The Parish Church, Kendal LA9 5AF. If you’d like to take part, email your name, postcode, voice part (S,A,T,B) to SOPcongregations@avantimedia.tv and include “Kendal Recording” in your subject header. Fr Michael is away this week on a course in Glasgow. If you need a priest in an emergency, please contact the Rectory in Warwick Square on 01228 521509.